Registration for this workshop closes the day before the event. Join us to learn all about Keyboarding Without Tears®! 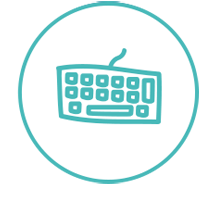 This 2.5 hour online workshop will teach you how to easily weave keyboarding into your K-5 day. You'll leave with a library of award-winning teaching strategies to help your students succeed with today's computer-based assignments and testing. This is a virtual, instructor-led workshop. Use your own laptop or desktop to participate in this online workshop through the internet. Additional time with the presenters for a voluntary, extended Q & A and +Live Insights® practice session is available for participants to join after the workshop. This is an intermediate level workshop. Conduct an ON24 system test. View the Virtual Workshop Introduction video. Information in this video prepares you for the virtual learning event. If you have issues joining the webinar, review the Webinar Help Guide. This is a highly interactive workshop and in order to have the best learning experience it is recommended to join using two monitors or two devices. Verify that your system is compatible with our Keyboarding Without Tears requirements. The day of the workshop, log in to the ON24 link at least 15 minutes prior to start time to test the workshop link and your audio connection. This is the live virtual workshop only. A recorded link will not be shared following the event. Times listed below are in Eastern Time, please check your time zone for appropriate start time. Test ON24. Conduct an ON24 system test. Verify that your system is compatible with our KWT requirements.